AUTO 2019 - From the land of polar bears to “Auto 2019” in Kipsala! Auto 2019”, the largest motor show in the Baltic countries, to be held at Kipsala International Exhibition Centre, 12–14 April, presents new passenger cars, tuning masterpieces, racing cars, special and, of course, unique vehicles. The most remarkable of them showcased this year is the impressive all-terrain vehicle Burlak that is the unique one in the world. You won’t miss the Burlak ATV – it’s huge! The length of it is 7.2 m, width – 2.9 m, height – 3.2 m. Although aluminium is much used in its lining as a lighter material than steel traditionally used in the automotive industry, the actual weight of the Burlak ATV with all of its parts and everything inside it including cargo and passengers is 6.3 tons. The team members say that the vehicle’s monstrous size can be most effectively estimated, when standing on its roof. The impressive all-terrain amphibious vehicle has been tailored to extreme permafrost conditions, where temperature falls near to 60 degrees below zero. The Burlak excels in driving around in mountains and through swamps, mud and bodies of water, snow fields. Its maximum speed on the water is up to 6 km/h. In this case, tyres serve as an air cushion. The pressure in tyres can be easily adjusted to surface conditions from the cabin. However, the Burlak’s benefits start where tarmac ends. It is simply not meant to be ridden on paved roads. Although the Burlak and its crew have their permanent home in Latvia, the vehicle itself has been built and purchased in Russia. Its developers have subsequently created new ATV models, but they are completely different from the Burlak. Fashioned from a BTR transport vehicle, this unique ATV has six wheels. The Burlak is equipped with a 3-litre Toyota diesel engine producing 170 hp, similar to the Land Cruiser off-roaders and the Hilux pick-ups, and an automatic gearbox. All of the engine components and systems are accessible from the cabin, that includes several compartments – technical, sleeping (four berths and a small luggage room), entrance unit and driver’s area. Long-lasting autonomous travelling without help from the outside world is provided by the 380-litre fuel tank. However, Burlak’s all-terrain mission is not over. 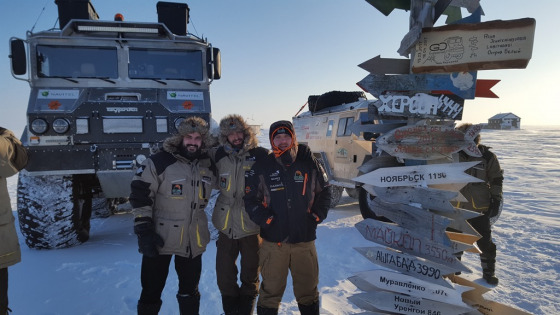 The crew is looking forward to more ambitious expedition and they are going to reveal their plans to their potential cooperation partners and wider circles of audience during “Auto 2019”. Visit the “WhatCar.lv” stand to see this monster in a close-up. The international motor show “Auto 2019” will present the latest car models, commercial vehicles, professional tools and equipment, impressive tuning masterpieces, and other automotive news. “Auto 2019” is held by the International Exhibition Company BT 1. Children under 7 years of age – free entry! There is a Swedbank ATM in the foyer of the International Exhibition Centre.